Sports Port is the leading provider of high speed wireless internet access for sports venues. We offer a range of products and services that address the needs of sports venues of all sizes as well as for temporary sports events. 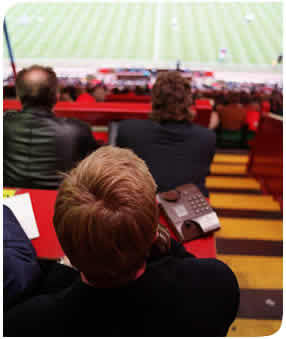 More and more people are becoming accustomed to broadband internet connections, in the office and at home - now you can offer the same high-speed connections to your own staff, and to visiting journalists, photographers and other professionals when they are in your stadium. Sports Port typically provides coverage in the press box and press room, extending coverage where appropriate pitch side and beyond, into corporate hospitality areas and any public locations. As well as providing a great service to professionals in your stadium, Sports Port offers you a new revenue stream. We provide solutions for any size of sports club or venue and take care of all aspects of the design, installation and management of the solution. Full customer support and billing is provided as part of the package. Sports Port provides temporary high speed wireless internet access at any sports venue, across an extended area or stadium for the duration of an event. Sports Port provides bespoke network solutions for sports venues including broadband access, wired and wireless solutions, VoIP and complete stadium infrastructure. Please contact us for further information.